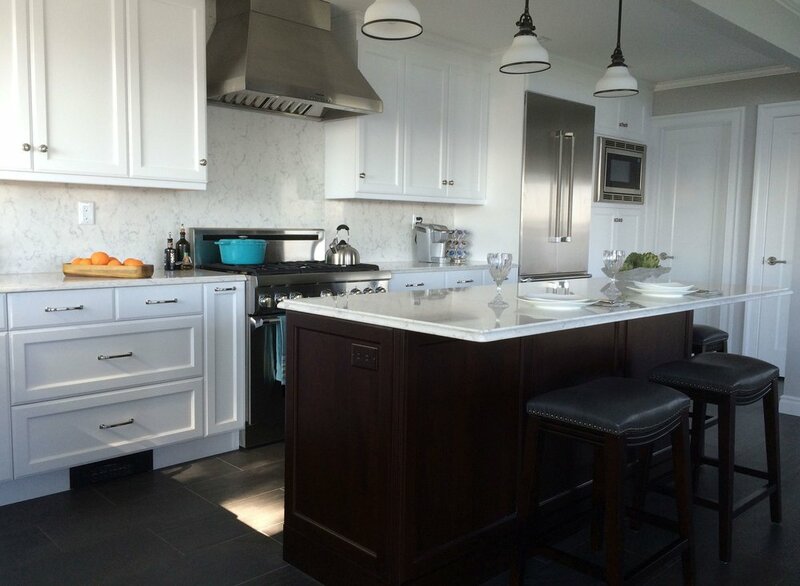 This kitchen renovation has shaker style white kitchen cabinets, and a dark stained cherry kitchen island. The owner enjoys her morning coffee as well as her Hudson River view while sitting at the island. When it came to choosing a sink, the owner opted for this large, spacious apron front sink. Working at the sink takes on an entirely different meaning when you also have a view of the Hudson River! The built in refrigerator, pro gas range, convection microwave and its open concept layout make this kitchen ideal for entertaining. Choosing just the right kind of cabinet hardware is a critical part of achieving a cohesive look and style. Knobs and pulls were chosen for this particular kitchen. The owner chose basketweave tile for the flooring in this bath remodel. 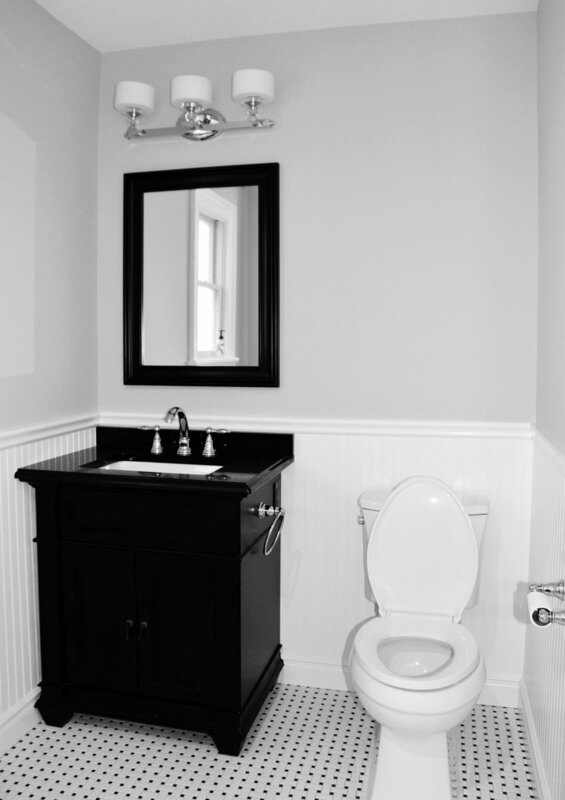 Along with the black vanity, and white beadboard the result is a traditional yet timeless guest bath design. Our client was adamant about showers with good water pressure. So, we specified this Nameeks showerhead often used in high end hotels. Despite it's small footprint, you can't ignore this powder room with its white cabinets and custom wainscoting in high contrast with the dark gray walls and floors. The wainscoting, dark gray walls and contemporary wall sink make this a traditional powder room with more than a hint of edge and a lot of style. To accommodate the narrow layout of this powder room, we opted for this functional yet stylish wall mount sink. This wall mount sink is ideal for spatially challenged bathrooms!